Will your next car be a smartphone? 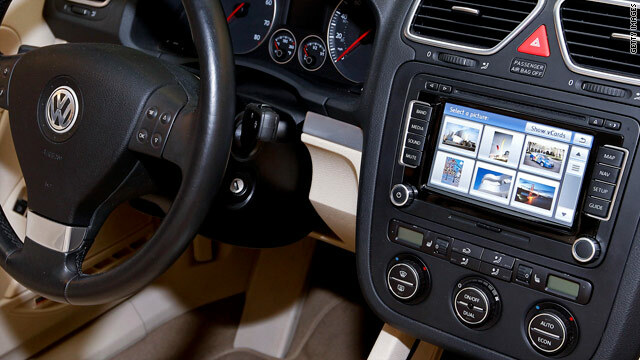 Car 'infotainment' systems, like this one in a Volkswagen EOS, are putting smartphone-like abilities into the dashboard. (CNN) -- Forget about using your smartphone in the car. Your next car might be one. A growing number of auto and electronic companies are creating systems that put touchscreens, and the ability to talk and text, right into the dashboard. In the near future, a significant percentage of new cars on the road are expected to come equipped with the ability to update Facebook statuses by voice and even surf the Web from the driver's seat. Ford, General Motors and several other automakers are pitching the systems as a safer and easier way to let drivers do what many of them are already doing -- using their smartphones while driving. "We saw this trend of mobile devices increasing, and we said this is an area where we can offer the customers a safer way to use those in the car," said Ford spokesman Alan Hall. Safety experts aren't completely convinced, though. Some say that while hands-free devices remove part of the danger from using phones while driving, it remains to be seen how such devices are going to be used. Thursday: How smartphones can make it harder, or easier, to drop off the grid. "There's still a lot we don't know about how these 'infotainment' systems are going to affect how people drive," said Russ Rader, spokesman for the Insurance Institute for Highway Safety. "We still don't know how drivers are going to integrate these systems into their driving environment." Ford has been a leader in the field with its Sync and MyFord Touch systems, in which phones, MP3 players, radio and navigation tools all can be controlled by voice or by using an in-dash LCD screen. MyFord Touch has a Wi-Fi receiver built in, effectively creating a Wi-Fi hotspot in the vehicle. At the end of this year, Ford plans to roll out "App Link," a voice-control system that links apps from the user's smartphone to the car in some models. It will launch with Android and BlackBerry systems; the iPhone operating system and Windows Phone 7 will be available by the end of 2011, Hall said. The technology will be available in 80 percent of Ford vehicles within five years, according to Hall. But Ford is hardly alone. And it's not just car companies that are getting involved. General Motors is promoting its own smartphone-like capabilities as part of an upgrade to its OnStar system. The improvements are designed to go after Sync, which has been a hit for Ford, especially among younger customers. Pandora, podcasts and Wi-Fi are included. And GM officials say future versions may include the ability to update Facebook statuses and send text messages by voice control. "Our system is first and foremost about safety and security, but we are evolving that now to include connectivity," OnStar spokesman Sam Mancusotold Wired magazine last month. "Some people might say that we are behind in that space, but we are not. We were doing connected services as far back as nine, 10 years ago, but the marketplace really wasn't ready for it yet." Microsoft and Kia Motors have teamed up to create UVO, a touchscreen and voice-enabled system that lets drivers make calls, send text messages, change radio stations and scroll their music playlists. It features a 4.3-inch dashboard screen, about the same size as the screen on the Droid X and some other smartphones on the market. "[The system] is a breakthrough for in-vehicle infotainment that helps allow drivers and passengers to safely and easily use all of their personal technologies to create personalized in-vehicle communications and entertainment experiences," said Michael Sprague, vice president of marketing for Kia. Early this year, Pioneer unveiled an enhanced stereo system that integrates maps, the Pandora music site and other apps -- plus another that allows devices such as iPods and home computers communicate. Rader, from the highway safety group, said that with more options come more opportunities for drivers to get distracted. "It's true that with a truly hands-free system, you're not fumbling with a device. You're not trying to dial a number," he said. "But the conversation itself appears to be a major part of the distraction. There's no indication from the research that we're making things more safe by going hands-free." It's difficult to track the exact role smartphones play in traffic accidents, since many wrecks are caused by more than one factor. The National Highway Traffic Safety Administration, though, says that cell phone use "whether it is a hands-free or hand-held device, degrades a driver's performance." And a growing number of people worldwide own smartphones, which add Web surfing, apps, games and GPS-mapping to the list of diversions available to phone users in the driver's seat. According to a Pew report, 38 percent of Americans accessed the internet on their phone last year -- up from 25 percent the previous year. Hall said the new in-car systems address a simple truth. People already are driving while talking, texting and tweeting. Anything that can make that safer, he said, is a good thing. "It really doesn't add any level of distraction to a driver that a driver can't already do," he said. "If they want to surf with a laptop in their passenger seat, they can do that in a car from 1970." Future plans for the Sync system include the ability to surf the Web on the in-dash touchscreen, but only when the vehicle is in park. "Distracted driving isn't new," he said. "It hasn't suddenly appeared because of all this new electronic technology. Drivers who use their phones a lot might be the kind of drivers who would be distracted by other things. "We just keep inventing new ways to distract ourselves."